Horoscope of Helen Keller - Changing Destinies & Destinations. This article is dedicated to those who are willing to put their best efforts to overturn so-called Destinies imposed by others. It is also dedicated to those who love to talk about committing suicide during consultation interactions with me. For all those who don't know about Helen Keller, please check this - https://en.wikipedia.org/wiki/Helen_Keller. She was the first deaf-blind person to earn a bachelor of arts degree. Indian readers would identify with her quickly with Black Movie of 2005 which was based on her life. Helen Keller was born on 27th June, 1880, 16.02 PM at Tuscumbia, Alabama, USA. There are different birth details available on Indian Astrology Sites but I prefer to trust Western Astrology Site data as they can have better access to her details. Also, I checked her chart with her life events and timing of those events. I am satisfied with these birth details as dots are connecting. As we can see that she was Scorpio Ascendant. Rahu in 2nd house/Sagittarius. Moon in 4th house/Aquarius. Jupiter in 5th house/Pisces. Saturn in 6th house/Aries. Sun-Venus-Ketu in 8th house/Gemini. Mars-Mercury in 9th house/Cancer. A troublesome life to start with. Guidance and Association of her Teacher Anne Sullivan. Work as Author, Speaker & Political Activism. A troublesome life to start with - As we can see that she was born a Scorpio Ascendant with 3 planets Sun-Venus-Ketu in 8th house. 8th house and Scorpio has same energy of Changes, Transformations and Unstable Life. So, this much energy in Scorpio and 8th house is good enough to screw anyone's initial life. I can vouch by that being a Scorpio Ascendant. One basic reason is that Mars rules their 1st house of life path and it also rules their 6th house of obstacles. So, their life path gets directly connected with obstacles. For Helen, Mars was debilitated. So, some huge obstacles to face. But then Jupiter aspect and Neech Bhang Raaj Yoga gave her courage to fight all the adversities. 6th house is house of illnesses and Saturn represents misery. Saturn is debilitated in 6th house.Aries. Aries lord is Mars and Mars was also debilitated. So, this indicates some life long health issues as Saturn represents long term matters, not only Saturn was debilitated but its lord Mars was also debilitated. Hence, she was supposed to go through such problematic life. Saturn rules her 3rd house/Capricorn of Light Ear and it is debilitated. Mercury rules her 11th house/Virgo of Left Ear and it is with its great enemy Mars in enemy sign Cancer where Mars is debilitated. Hence, she had this problem with Listening. 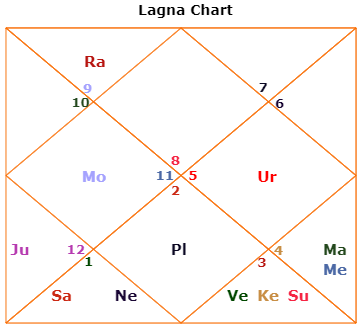 12th house/Libra represents Left Eye and its lord Venus is in 8th house/Gemini with Sun & Ketu. So, Ketu's association and Sun's combustion impacted Venus. On top of that, Saturn's 3rd aspect on Venus and Sun, impacted her eye sight and overall health respectively. 2nd house/Sagittarius represents Right Eye and she had Rahu there. Also, its lord Jupiter is although in own sign Pisces but it is in Sandhi Conjunction with Saturn in 6th house/Aries, as they are within 10 degrees. Hence, long term Eye problems. Suddenly, I feel like I have an awesome chart for a Scorpio ascendant. Guidance and Association of her Teacher Anne Sullivan - But the biggest event of Helen's life was when she was given in care and guidance of her life long Teacher/Guide/Coach Anne Sullivan, a visually impaired lady herself. It was in March, 1887. Dasha was Jupiter-Rahu. Jupiter is Teacher or Guru. It is in 5th house/Pisces of Education. Rahu is in 2nd house/Sagittarius ruled by Jupiter, hence changing itself as Jupiter. So, Jupiter was active at both levels of Dasha. Jupiter-Saturn Sandhi Conjunction now made this a life-long association between the two brave ladies. And guess what, Rahu played its part of being unusual/weird as Anne Sullivan's job was to teach Helen in a very unusual ways, i.e. through sign languages or impression of lips. Graduation in 1904 - Then Helen went for a formal education in 1888, still under Jupiter-Rahu Dasha. Eventually, she graduated in 1904 becoming the first deaf-blind person to earn a Bachelor of Arts degree. Dasha was Saturn-Rahu. So, her immense hard-work and struggle against destiny was rewarded by Saturn - The Lord of Justice. Her Saturn dasha started in Dec, 1888. So, we can imagine what kind of hard work and perseverance Helen and Anne would have put in those 16 years to receive benefits from Saturn. This is what I say about Saturn that nothing comes easy with Saturn. You have to put your best effort over the longest period of time to get any good news from Saturn. Saturn doesn't know any other way and doesn't have the clause of Mercy in his rule-books. Work as Author, Speaker & Political Activism - But what follows after Saturn is the time to reap fruits of your Labor. After Saturn dasha, her Mercury dasha was totally dedicated to her literary work where she became known as author, speaker and political activist. She was awarded Honorary Doctorate Degree by many Universities of the World. This was very much reflective of her Mercury in 9th house. She was also vocal on the rights of disables. Her 8th house and 9th house completely came to fore during Mercury MD and Ketu MD, Venus MD and Sun MD kept her involved in service to people through her literary work. Anne Sullivan remained her companion till 1936 when Anne died after a coma as a result of coronary thrombosis, with Keller on her side. Destiny or Free Will - And this life of Helen Keller brought me back to the question as to whether everything is destined or there is free-will. I have written about it (http://astrosaxena.com/ffwse) and said that everything is destined. I even said that Free-Will is nothing but Ego-Assertion. I still say the same but I guess I am misunderstood as it is common to happen. Everything is pre-destined but problem is that none can know what is pre-destined. None can claim that he has completely decoded his or anyone else's destiny. Accept anything as Destiny when you have put all the best efforts in that matter and you are left with no desire to make any further effort. As long as you feel the desire of taking actions and changing the situations of life, it shows that the current situation you are in, may not be your destiny. Like, I gave the example of King Shudhdhodhan in that article who tried his best to prevent Siddhartha from becoming a Monk. Now, after putting all his efforts, he can say that it was in destiny but not before that. And as always, with Free-Will and your actions too, you will only serve the Destiny. The main purpose of looking at this Legendary Life of Helen Keller is the kind of interactions I used to have nowadays with people where everyone has only complains about his/her life and after every complaint they like to add that it is better to commit suicide or anyone else in their situation would have committed suicide. Well, then what are you waiting for? Why are you wasting my time on call? There are hundred ways to commit suicide and run-away like a fugitive from life. Please select the most swift and sure way. But rest assured that reason behind your act of Suicide is not your problems of life but your cowardice to face them. You have no idea what many people like Helen Keller are facing in this world and they never even complained. All they have is gratitude towards life. So, when you are done with this ego-trip that only you are facing all the problems of life then come back to reality and try to take inspirations from people like Helen Keller and Anne Sullivan.